Juul Lawsuits Are Spreading – Is This the End of Vaping? Many of us grew up hearing that smoking cigarettes is bad for your health. They cause 80% to 90% of lung cancer cases, raise your blood pressure and increase your chances for developing heart disease. For decades, cigarette companies have searched for an alternative to lower health risks while providing the same effect. Enter Juul, an e-cigarette company founded in 2017 that markets itself as an alternative to cigarettes. The company has come under fire this week in the wake of three lawsuits alleging the devices have caused Juul users to become addicted to nicotine. One of the Juul lawsuits was filed by the parents of a 15-year-old boy who they claim is addicted to the vaping device and the nicotine it provides. In addition, the Massachusetts Attorney General opened an investigation into Juul to determine if the company is targeting minors with their products. Although Juul vaping devices are intended for adults 21 and older, they have become popular among teens, particularly high school students. In fact, the devices are so trendy many kids use the word as a verb, often referring to the act as “juuling.” There’s growing fear that vaping will becoming the next generation’s version of smoking, a concern supported by a 2017 CDC study, which found high schoolers and middle schoolers use e-cigarettes more often than regular ones. Currently valued at $15 billion, Juul Labs (the company that makes Juul products) controls approximately two-thirds of the vaping market. The company was founded with the stated intention of helping adult smokers stop using cigarettes in an effort to improve their health. Juul devices are small and easy to carry, with insertable pods that provide a nicotine hit in seconds. Although nicotine itself isn’t a carcinogen, it’s an addictive substance that alters brain function. The pods come in a variety of flavors like mango, mint, creme brulee and “fruit medley.” All of these contain nicotine salts similar to the compounds found in heat-dried tobacco leaves that are used to make most regular cigarettes. According to the company and some users, Juul’s products are less harsh to inhale than the “freebase” nicotine used in other e-cigarettes, providing a more enjoyable experience. Unfortunately, this flavorful nicotine delivery just makes the product even more attractive to high schoolers and young adults. Three lawsuits have been filed against Juul, two in California and one in New York. All three base their claims on similar arguments, including early marketing by Juul, nicotine levels in pods, and studies. There are also arguments that the company doesn’t have sufficient safeguards in place to ensure the products aren’t sold to minors. 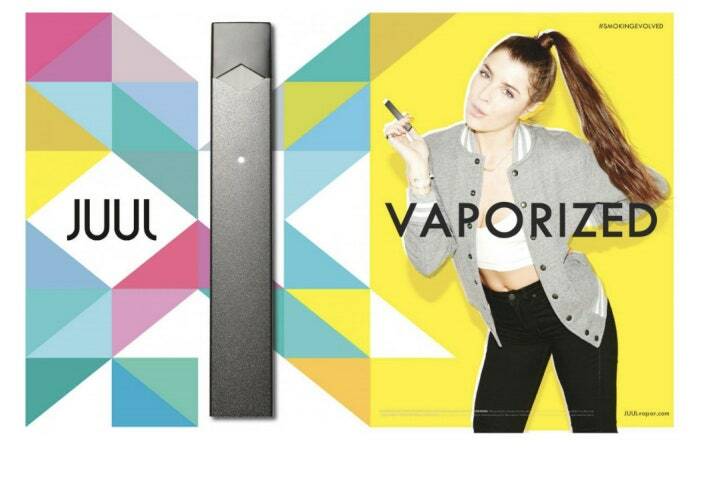 An early marketing campaign “VAPORIZED” featured young people on bright backgrounds, encouraging teens to buy and use Juul devices. The amount of nicotine in one JuulPod equals the nicotine in a pack of cigarettes, which makes the devices more addictive than advertisements suggest. At least one study has shown that social media posts and influencers boosted Juul’s popularity, further encouraging teens to use the devices. Juul does not have the proper checks in place to ensure those under 21 aren’t purchasing and using their products. The complaints filed in California – one in the U.S. District Court in Northern California and another in San Francisco Superior Court – allege that Juul deceptively marketed their product as safe despite it being more addictive than traditional cigarettes. The plaintiffs seek monetary damages as well as an injunction against Juul’s marketing practices. In both cases, the filers bought Juul to help them quit smoking but have ended up addicted to the product, one of them to the point where he becomes agitated and moody if he doesn’t smoke JuulPods daily. Parents of a boy referred to only as D.P. have filed a lawsuit against Juul for making their son addicted to nicotine. They claim D.P. is now prone to outbursts and is doing poorly in school because of his nicotine addiction. Despite measures to prevent him from vaping, D.P. still finds ways to engage in juuling, even though he’s disciplined at school and home. In April of this year, the U.S. Food and Drug Administration (FDA) promised to crack down on illegal sales of Juul to minors and demanded the company hand over any research they had on how kids were using their products. The FDA didn’t begin regulating e-cigarettes until 2016, at which point it began requiring e-cigarette companies to submit a premarket application in order to sell their tobacco products. All companies were supposed to submit these applications by 2018, but this deadline has been pushed out to 2022, a move that caused many public health groups to sue the FDA in March over the decision. If Juul violated Massachusetts law by not taking adequate steps to prevent minors from purchasing their products. Whether Juul intentionally markets their products to people under 21. If the company properly monitors retailers selling their products to ensure consumers are over 21. Juul has released statements that it will cooperate with the FDA by turning over any documents they have related to the investigation. In response to Healey’s call for an investigation, Juul’s chief communications officer released a statement that they welcome the chance to work with the Massachusetts Attorney General in the matter and that they use stringent online tools to ensure their products aren’t purchased by anyone underage.